Sunday, May 22nd with the sun shining and temps hitting the low 80s, I made the glorious journey to Cleveland, Ohio to visit A Christmas Story House and Museum. You may remember that this film's story about Ralphie Parker and his quest for a Red Ryder BB gun at Christmas takes place in Hammond, Indiana. However, many scenes of the 1983 film were actually shot in Cleveland, Ohio. The house used for shooting in the film has since been turned into a hip destination spot and includes a museum and a gift shop across the street. Inside A Christmas Story House--next to a Major Award! 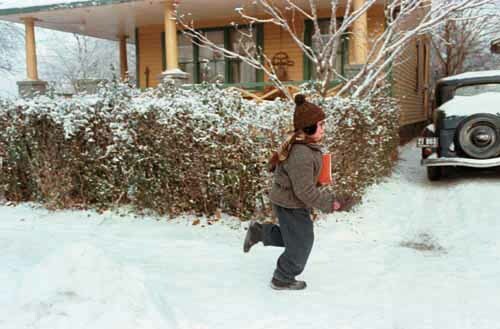 Click HERE to see my early post about the movie A Christmas Story. Inside A Christmas Story Home, you will find reproductions of period 1930s-1940s furnishings and decorations. They encourage people to wander the home and photography is permitted. The above photo of myself was taken inside the House next to the Leg Lamp that stands in the front window. 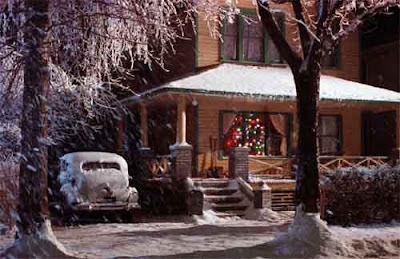 Across the street at A Christmas Story Museum, you will find actual costumes and items used in the filming of the original movie as well as photographs shot during the making of the film. Don't miss either venue--and the price of your ticket covers both buildings. However, photos are not permitted inside the museum. I recommend coming down to see the house, museum and gift shop in Cleveland, Ohio. Tours are conducted year round and begin every half-hour during their open hours. Check the website for prices and hours. On the random May afternoon that I attended, there were people from Texas, Wisconsin and cities throughout Ohio in attendance. This is definitely one of those pleasant places where it feels like Christmas all year long. Be sure to let me know if you make the trek--I'd love to hear about your adventure. 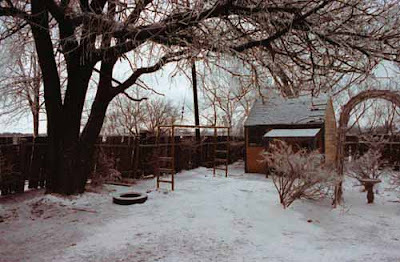 A still from the 1983 movie of the back yard where Ralphie met Black Bart--and nearly shot his eye out! Looks like a fun visit, but I think I would need to be in the area for some bigger reason and do this as a side trip. Will definitely keep it in mind, however! Love the pics! I really need to go there! Thanks for reminding me about this local destination. We were there last summer and it was great fun. Randy (aka Ian) was there to answer questions. We took lots of pics including my grandsons under the sink. Thanks for commenting everyone. A Christmas Story House website says that actor Ian Petrella, who played Randy Parker in the movie, will be back again this summer between June and August 2011. Maybe I need to go back? Great post - too bad you didn't try out as an extra when they made the call... who knew?? ?